Annotate Websites: Add notes to websites in Firefox, Internet-Explorer and all other website-browsers. Annotate your Outlook: Emails, Followup-Emails, Contacts, Meetings, Appointments. Make an Outlook backup to save your Emails and settings from Outlook. Gmail: GumNotes works with Googlemail, too! Annotate every separate Gmail with your notes! Reminders: Never forget an important meeting: With GumNotes – Timers! Synchronized: View and edit your notes on your IPhone, MAC, Android, Internet – thanks to Simplenote-Server support! Latest feature: Sync GumNotes with your IPhone! Our latest movie: Sync GumNotes with Simplenote-Server! View and edit your notes on your desktop as well as on your IPhone, MAC, Android phone or in a webbrowser! The latest release integrated full support of Simplenote! Simplenote is a free platform to sync notes on all your devices. Visit the Simplenote site and open a free account! Open the GumNotes window in the sys tray bar and write a note. 3. Next time you open the document GumNotes shows your note. Even for related documents GumNotes can show your note e.g. for follow up emails. When do I need GumNotes? Why you should use GumNotes? 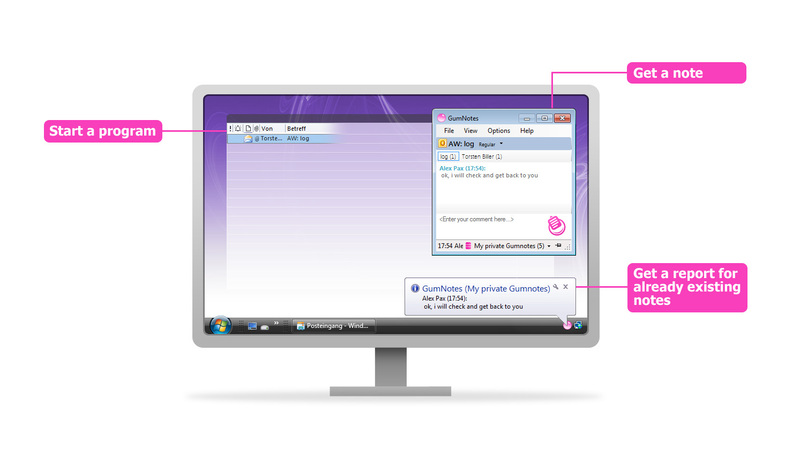 Easy to use: Effortlessly capture any information inside desktop sticky notes. It may be to-dos, reminders, appointments or notes. It’s Simple to understand GumNotes – GumNotes is so intuitive that there is nothing to learn.Just install the program & start getting benefitted right away. 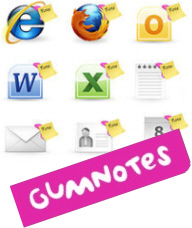 Attach GumNotes to websites – Extra convenient: GumNotes lets you stick notes to web pages & documents. They show-up automatically when ever you go back to that web page. 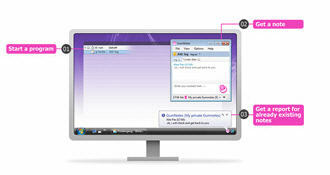 Enjoy creating sticky notes – Enjoyable experience: Using GumNotes like virtual sticky notes on your desktop is fun. Since creating a sticky note on desktop is just a click away, you would not procrastinate taking notes.